Stunning 2 tiered end / sofa table from Maison Bagues France 1940`s. 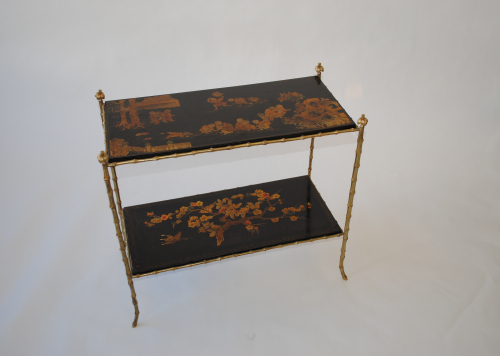 Faux bamboo legs and frame, crowned at each corner with palm tree canopies, supporting 2 lacquered surfaces in the typical Bagues chinoiserie style. Maison Bagues was opened in 1840 by Noel Bagues. Originally specialising in bronze lighting, the company moved to Paris and soon became a source of the finest brass, bronze and glass items, with offices in New York, London, Brussels, Rome and Cairo. As well as lighting thew company became famous for it`s collection of coffee/side/end tables in brass and gilded metal with glass, mirror, leather and lacquer surfaces. The lacquer pieces are particularly sought after.